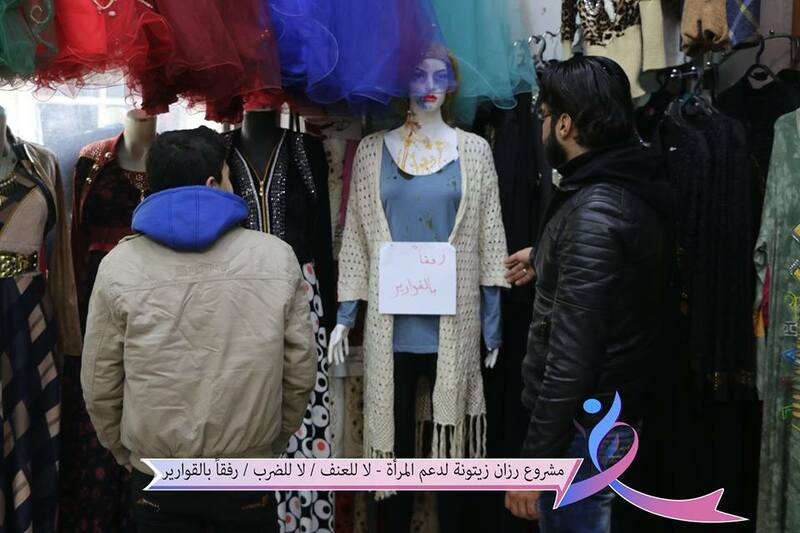 (Zaman Al Wasl)- Several plastic mannequins appeared on window shops in the town of Atareb in northern Aleppo province. The faces were marked by red and blue to show bruises. They wrote statements next to the mannequins encouraging men to treat women well. This campaign was launched by Razan Zaitouneh Project to Support Woman in the civil center in al-Atareb under the title" No to violence. No to beating”. The campaign in which 30 women participated, aims to highlight the violence against women. The project was implemented by trainees at the end of the project workshops held with the support of Baytna Syria Organization. The director of the civil center Mohammad Shakradi pointed to Zaman al-Wasl that the campaign aims to empower women in the community politically and socially and raise awareness of their role in building the surrounding local community as a start and work on the representation of women in local government institutions later. He explained that the project is a "civil and political educational workshops". The first workshop was devoted to the definition of civil society, what are its tasks, and how it can be a basic foundation for organization and political representation and the defense of women's rights in local government institutions located in liberated areas. knowledge of the functions of men and women in society, and where they should be active, and is scheduled to be workshops on the definition of women's rights in general, and the experience of women in the Syrian revolution. He clarified that the campaign of putting up mannequins came the center's volunteers noticed the increasing phenomenon of violence against women and abuse of women in the local community and in Syrian society as a whole. The idea was to spread these models in the form of abused women in order to raise awareness in the social environment and the need to find solutions to confront this phenomenon and to alleviate it as much as possible in order to reach a society free from violence against women. Shakradi pointed out that the selection of these models came to convey the suffering suffered by many women from physical and psychological abuse and was published in the markets because of the people's access to them and the possibility of seeing them easily. The project will be followed by the distribution of pamphlets written by trainees in the city of al-Atareb, which explains the role of women and the importance of their political representation in society and the need to take their role to to the fullest. The following activity will be devoted to an open dialogue session with the women of al-Atareb to discuss recommendations to activate the role of women and discuss the issues facing them and women in the liberated areas in general in order to find solutions for them. The Razan Zeitouneh Project to Support Women aims to train young women to be active in society and able to play a key role in proportion to the needs and aspirations of society.